ASPEN ” Singer-songwriter John Darnielle of the Mountain Goats says we should expect a fun time at the band’s Monday-night show at Belly Up Aspen. “I think people are sometimes surprised by how much emphasis we place on having a good time. People expect the dude who writes dour songs about divorce to be dour in person, I guess. But making music is pure joy, so the live experience is kinda wringing joy from dour songs,” Darnielle wrote in an e-mail interview last week. Darnielle’s interviewing method is characteristic of his song-writing: He reaches for that particular emotion or image, never resorting to the easy cliche. The band (while other members visit and even linger, Darnielle is, in Jeff Tweedy/Wilco fashion, Mountain Goats’ essential member and creative engine) trades in short, sharp songs laced with interpersonal conflict and domestic longing, and rich with historical and literary metaphor. Recent albums have taken on thematic threads. “We Shall All Be Healed” (2004) mines a group of friends addicted to methamphetamine. “The Sunset Tree” (2005) dissects Darnielle’s relationship with his abusive stepfather. Mountain Goats lyrics, while not always autobiographical, are intensely personal in nature. Some of the power of the Mountain Goats’ songs derives from their specificity. Much lyrical energy is devoted to particularizing scenes and circumstances, as in “You and Your Memory,” from “The Sunset Tree (2005). Darnielle spits out these lyrics in raw, unaffected bursts, creating a vocal path through the song that’s not dictated strictly by the gorgeous acoustic-guitar-driven melody lines. His voice hops along in a high register, and while he doesn’t really miss notes per se, he’s not afraid to let one fall in grating fashion: This raggedness is key to the emotional content of the songs. In addition to Darnielle on vocals and guitars, Mountain Goats are traveling with a bassist and drummer: It’s frankly not clear who, though Peter Hughes and producer John Vanderslice are integrally involved in the Goats’ current sound. 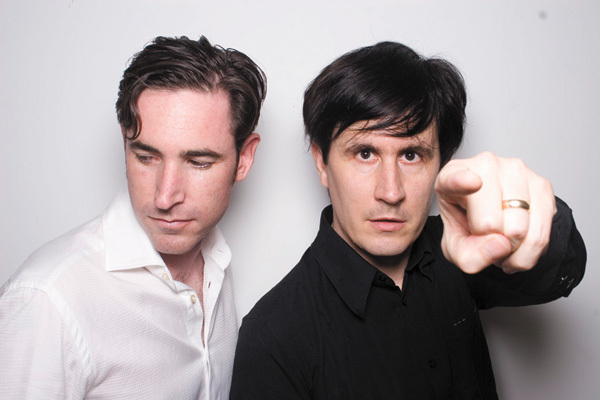 Mountain Goats have been an indie phenomenon throughout much of their 15-year existence and were well-known early for their productivity, their low-fi approach (solo home recordings on a boombox cassette player), and their eclectic subject matter. His discography includes titles such as “Yam, the King of Crops” (EP, 1994), “The Hound Chronicles” (EP, 1992), “Jam Eater Blues” (single, 2002), “Full Force Galesburg” (album, 1997), and “Beautiful Rat Sunset” (EP, 1994). And these were just the ones that saw daylight. “Writing songs involves some blood and sweat, but really, is it asking that much of a dude to write a song a week? And, if not, wouldn’t that equal 52 songs a year? And if he’s a decent songwriter, should half those songs be good? I hope so,” he writes. “I do write slower than I used to, it’s true, but I think that’s just because I’m busier.” Indeed, Monday’s show is one of 13 in a 17-day period.